The lead-up to Wednesday's new comics felt a lot like the days before Y2K came about. Back then, everybody was freaked out wondering what would happen to all the computers in the world when the date moved from 1999 to 2000. Would the world come to an end? Well this week was similar with the release of Amazing Spider-Man #666 -- the prelude to the Spider-Island storyline -- along with nearly 150 variant covers from comic book stores through the US and around the world. So the world didn't end back in 2000, and it didn't end this week either. But for Spider-Man completists the world gets a lot harder to live in (not to mention more expensive) when faced with the daunting task of getting a copy every store variant. All that aside, this week we have 10 new Spider-Man comic book appearances ranging from regular issues, to variant covers, and new printings of older books. This is a light week with only 7 new comics featuring Spider-Man appearances, and only one issue is a variant. I honestly can't recall the last time I bought new comics when a variant wasn't included. Oh the days. Marvel has announced their freebies to be given away at the 2011 San Diego Comic Con, and a new issue of the Marvel Mix Tape giveaway comic is included. The comic will feature exclusive previews of upcoming Marvel comic books and the entire first issue of one of Marvel’s most popular comic books. Based upon the cover, it looks like they're putting the first issue of FF#1 in there. Regardless, it features Spider-Man on the cover so all of you completists will want to get this one. Myself included. This is the latest in a series of Marvel Mix Tape giveaway comics that have been released at major conventions over the past few years. To date there have been 6 issues released primarily at San Diego Comic Con and Chicago Comic Con. Spider-Man has made at least a cameo appearance in each issue to date. Have a great time this year if you make it to the 2011 SDCC show. I'll have to get my copy of the Marvel Mix Tape comic on Ebay (sound the violins). There's a variant edition of the Ultimate Fallout "Spider-Man No More" #1 issue available at this year's San Diego Comic Con. It's noted that the issue will be limited to 3,000 copies. The cover features an inverted white background version of the regular edition, and has the SDCC logo included as well. If you can't make it to San Diego like me, then you can pick up a copy on Ebay at a variety of price points. This week had the potential to be a huge (re: costly) one with around 45 new books from Marvel alone hitting comic shop shelves, and that doesn't include the dozen or so new trade paperbacks too. 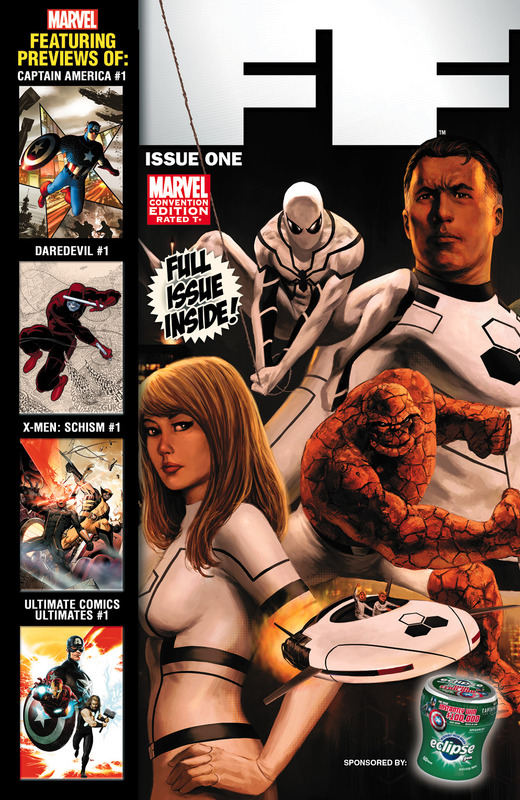 Plus Marvel felt the need for 18 of those new comics to be variants. Heck! There are 14 comics alone from three newly launched series including Captain America, Ghost Rider and X-Men Schism. Well, Spidey wasn't in any of those. But it was still a relatively heavy week with a total of 12 comics and variants featuring a Spider-Man appearance this week. Before I get to the list of new Spider-Man appearances for the week, I want to send a quick shout out to my local comic shop and all of the shops around the country for all of the hard work they do each week getting the comics ready for us to check out. It's funny, but I can't think of any other retail business that I visit each and every week. I suppose some folks can get that from shopping for clothes, but give me a wall of new comics and I'm in hog heaven. ...the comics show up on Wednesday morning and comics shops race to get them out for our consumption. Nice job by everyone. It's a mighty big haul this week with 18 new comics featuring Spider-Man appearances. We've got regular books, variant covers, promotional giveaway comics, and magazines.